Amigo the dog licks Spiral's face as he returns to their van in a shopping center parking lot in Athens, Ohio. Spiral has permanent residence in California, but spends several months out of the year traveling to the east coast and then back to California in an RV. There are six dogs total that travel with Spiral and his companions. Riley Gates, left, and Solar, right, dumpster dive for Little Caesers pizza behind the shop in Athens, Ohio. The travelers don't stop at typical restaurants or grocery stores for food, but find most of it by dumpster diving and finding food. Their trailer was full of bags of nachos at the time, found in a gas station dumpster and only slightly expired. Solar smokes tobacco out of a pipe while travling toward Indianapolis, Indiana. Travelers sleep after staying up late the night before as Spiral drives while heading towards Indianapolis, Indiana. Quotes and art written in permanent marker adorn the walls and ceiling of the van, including things like, "Not all who travel are lost," and "Believe nothing of what you hear and only half of what you see." 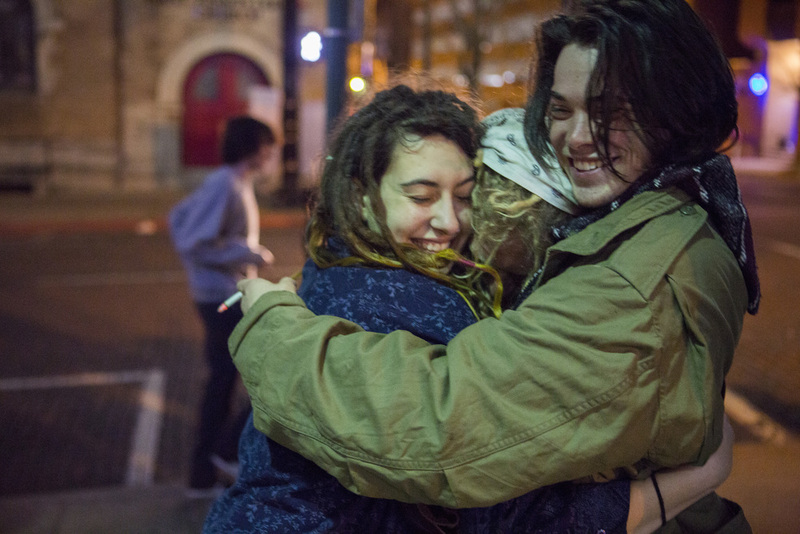 Kima, Solar, and Riley hug while Spiral and others play music on Court Street in Athens. A student joins in drumming as Spiral plays the bucket drums on Court Street in Athens, Ohio. While they didn't garner much attention at first, soon Spiral and his friends' playing garnered a small, energetic crowd. They made over $100, as it was mom's weekend at Ohio University. In order to get money for gas, Spiral and his fellow travelers play music on the street wherever they stop. When Spiral starts out traveling, he doesn't take any money, food, or resources, but rather makes or finds it all along the way. He says, "that's what separates a vacation from an adventure." Jesus rests on the bed in the back of Spiral's van after staying up late the night before. Days on the road in the van can include sharing stories, talking and playing guitar, or can be quiter with travelers doing individual things like resting, petting dogs, or reading a book. Dogs play while Spiral, left, and Jesus, right, figure out what to do for the night while parked in a shopping center lot in Athens, Ohio. Spiral and his fellow travelers had been attending a local "jem and jam" show at the Cool Digs rock and garden shop and were debating about when to go uptown to play music on the street. Spiral checks the GPS on his phone as he drives towards Indianapolis, Indiana. Spiral and his companions plan to stop in Indianapolis, then travel to Ferguson, Missouri, then onward through Kansas and to Colorado and finally California.